Why Do Pearland Dentists Like Potatoes? 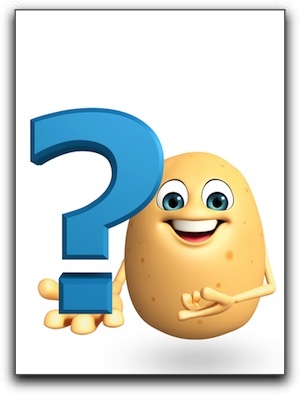 Home » Blog » Why Do Pearland Dentists Like Potatoes? The reason dentists like potatoes is because they are so “filling.” Ba-dum ching. Lame joke, I know. But seriously, the wiser our patients in Manvel and Friendswood are about what they eat, the easier it will be to care for their dear old teeth. It doesn’t have to be potatoes, but the mouth does request that we take a good look at what can be damaging and upsetting it. Sugars get converted by bacteria in the mouth to acids, which then attack the enamel on the teeth and start the decay process for Manvel people of all ages. Fruits have high water content, which can dilute the effects of the sugars they contain and get the saliva flowing, so they aren’t really no-nos. It’s the chocolate bars, hard candies, cookies, cakes, and pies that you need to watch out for. Oranges, tomatoes, lemons, and the like should be eaten as part of a meal to minimize their acidic effects. Friendswood folks are wise to eat a variety of healthy foods such as cheeses, chicken, other meats, nuts, and milk. The calcium and phosphorus in these foods will support tooth remineralization. The more often you eat, the more often your teeth are subject to the decay process. This can be tempered by choosing healthy snacks. And keep in mind, the later at night you eat, the more likely you are to not only eat unhealthy foods, but to skip oral hygiene altogether. I hope this blog helps with keeping you on the path to a healthy mouth and gives you something to think about if you’re interested in oral health or a smile makeover in Houston or Pearland, Texas. I’m David Montz of David C. Montz DDS, PA & Associates – Family, Cosmetic and Implant Dentistry. If cosmetic dentistry, including the porcelain veneers, dental implants, teeth whitening, and the like interest you, call 832-895-5120 to set up a consultation. We can discuss anything from cosmetic dentistry to gum disease treatment. Our friendly staff is ready to make you comfortable. We can schedule patients from Manvel for sedation dentistry, Invisalign clear braces, or teeth whitening right here in our office. Pearland customers are always welcome to check into CEREC dental crowns. Don’t hesitate to make the call.